“In my 10 years of experience evaluating what creates long-term health-and-fitness success, the single most important factor is having a support system,” says Wayne Andersen, MD, cofounder and medical director of Take Shape for Life, a nationwide health and lifestyle coaching program based in Owings Mills, Md. Exercise partners provide a powerful combination of support, accountability, motivation and, in some cases, healthy competition. “They can play the role of teammate, co-coach and cheerleader — all while working out,” says Michelle P. Maidenberg, PhD, MPH, clinical director of Westchester Group Works in Harrison, N.Y.
Ready to partner up? Great! But before you recruit the first warm body you see, keep in mind that not all workout buddies are created equal. The most successful fitness partnerships fall into one of three categories: the pal-based buddy system, the small group and the coupled pair. Take a look at them all, then consider which collaborative arrangement (or arrangements) might work best for you. A dynamic duo, typically friends or colleagues, who train together one-on-one or have developed a regular routine of connecting for fitness activities. Best for: Those who shy away from gyms and fitness classes when solo, or who tend to be more introverted. Great for those focused on specific, shared or complementary goals (e.g., losing weight, getting stronger, training for an event). Ideal for pals who want to spend more time together and be more active. Also great for coworkers or stay-at-home parents. “Finding time to work out around your job or the kids’ schedules can be challenging,” says Kara Thom, coauthor of Hot (Sweaty) Mamas: Five Secrets to Life as a Fit Mom (Andrews McMeel Publishing, 2011). “So it makes sense to recruit the people you see on a regular basis.” Have a coworker join you for a lunchhour workout, she suggests, or exercise with fellow parents waiting around during a child’s music lesson or sports practice. Why it works: “Having a reliable workout buddy increases your chances of sticking with your program,” says Elizabeth Lombardo, PhD, MS, PT, psychologist, physical therapist and author of A Happy You: Your Ultimate Prescription for Happiness (Morgan James, 2009). It can be hard to push yourself during solo workouts, she notes, and it’s dangerous to lift heavy weights without a spotter. 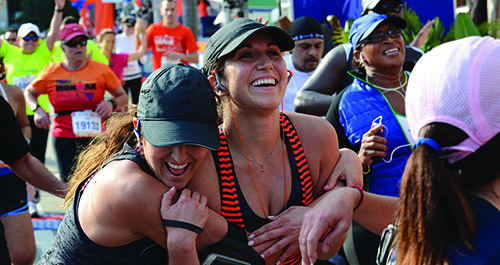 A workout buddy can provide some healthy competition while keeping you within safe limits. Potential pitfalls: “If your workout partner is down all the time, complaining, you will eventually lose motivation,” Lombardo says. Likewise, if he or she is too competitive, gives up too easily or is jealous of your success, it will bring you down. You don’t have to be perfectly matched fitness-wise (in fact, it can be helpful to exercise with someone who is a little fitter than you), but if you have dramatically different personality traits and divergent fitness goals, it can derail you, Andersen adds. Finally, beware of getting distracted with too much joking around or gossip. Your workout partner should make exercise fun, but not cause you to lose focus. She eventually discovered the best place to meet a reliable gym buddy is at the gym. “I realized that the people I saw there regularly already had the motivation to be healthy and active.” And, she knew their schedules aligned because she saw them consistently. So last year, Frommelt gathered her courage and asked one of the regulars, Liz Poloskov, 32, to join her for a workout. The women have met faithfully three times a week ever since. “Our fitness goals are slightly different — she wants to lose weight and I want to build strength — but it gives us a nice variety of routines and exercises,” Frommelt says. “We rotate doing cardio and lifting.” The women also meet with separate personal trainers once every few months and use that information to develop new routines. “Partnering up has helped me to try different exercises that I would not normally do, which has pushed my fitness forward. A small group of people whose membership may vary by the day, but who generally work out at the same preappointed time and place — as a group, with a trainer, or simply in the same vicinity as one another. Best for: People who like to combine social time with exercise; coworkers, students or parents whose schedules align; cyclists, walkers and runners, or any group of fitness-minded friends. Also great for people who like the interaction of a group but may not want to participate solo in a bigger group fitness class. Potential pitfalls: It can be more difficult to schedule workouts with multiple people, so you’ll want to develop a reliable system (e.g., phone tree, group texting or an online calendar). Pick regular workout times and stick to them, even if one group member doesn’t show. It can be a challenge to find or design workouts that meet everyone’s needs; good communication and periodic goals evaluation are key. Or you might try regularly attending a group fitness class together. Kasel trains one group consisting of two executives from the same company, along with a few of their family members. “They started coming together because their work schedules were similar, but they found an unexpected benefit,” he says. The execs, in addition to meeting their fitness goals, have discovered that their shared workouts translate to better problem solving and teamwork in the boardroom. “Working out together has actually expanded their communication about their business,” Kasel says. A romantic twosome who pursue their fitness activities together. They may or may not do the same workout, but they block off time and space for being active as a couple. Best for: Romantic partners who support each others’ goals; couples who need more quality time together and have trouble fitting it in their schedules; parents who can take advantage of childcare at the gym; anyone looking for a fun, active date. Why it works: You’re most successful at reaching your goals when the people closest to you are on board — or, better yet, an integral part of the team. Scheduling is often easier with a partner, since you can carpool to the gym. All those endorphins and pheromones work to increase your attraction, too. “When you’re empathetic and praise your partner during a workout, it spills over into your relationship,” says Lombardo. You learn you can tackle anything as a team, and that makes for a stronger relationship. Potential pitfalls: If either of you is given to bickering, bullying, pouting, competing too aggressively or sabotaging the other’s workouts, nobody’s going to benefit. Before you start a workout routine with your sweetheart, discuss how you’ll handle situations such as one person bailing or pushing too hard. Talk about your goals (shared and individual) and how you can best encourage one another. You might also make a “no criticism” rule during your workouts. Keep in mind, whether you’re currently working out with your spouse, a buddy or a whole passel of fitness pals, there’s no need to limit yourself to just one fitness partnership. You can hit the gym with your sweetie a couple of evenings a week, walk with a colleague over the lunch hour and ride trails with your cycle club on the weekends. The more people you have actively engaged in supporting your fitness efforts, Andersen says, the more likely you all are to enjoy the process, and the results. Experience Life is the award-winning whole-life health and fitness magazine dedicated to empowering people to become their best, healthiest selves. Read more about the underpinnings of fitness — things like self-knowledge and self-esteem, clear priorities, enthusiasm and willingness — at www.experiencelife.com.